A second large consumer group representing 500,000 Coloradans joined the call Tuesday for the resignation of a health industry insider from Colorados new health exchange board. The Colorado Consumer Health Initiative called on Eric Grossman, vice president of strategy and government affairs for TriZetto, a Greenwood Village health IT company, to step down from the nine-member board. Gov. John Hickenlooper appointed Grossman to serve as on the board that will design a new online health insurance marketplace for Colorado by Jan. 1, 2014. He was supposed to be one of the non-industry appointees, but consumer groups have become concerned over his connections to health insurance companies and his views that seem contrary to supporting a competitive market. TriZetto is a 2,000-employee company that says it touches half the U.S. population through its contracts with health insurance companies. As a health industry insider, his appointment tips the scales away from a board concerned with meeting the health care cost, coverage and quality needs of small businesses, individuals and families and toward the interests of insurers, said Dede de Percin, executive director of CCHI. Many of TriZettos clients will directly benefit from the development of the exchange and insurance industry representatives sit on TriZettos board, De Percin said. This, combined with Grossmans publishedstatementsabout the potential profitability of the health benefits exchange, raises serious concerns for Colorados consumers. On Monday, the leader of the Colorado Public Interest Research Group (CoPIRG) was the first to call on Grossman to resign. Grossman said Tuesday that he has no intention of resigning. The increasing pressure (on me to resign) was based on the fact that they werent aware that we have recused ourselves from pursuing any health insurance contracts with the state. We dont see any reason to resign, Grossman told Solutions. Were not a health plan. Were a vendor, he said. We just so happen to have very applicable experience we want to offer to the state. Grossman said he was born and raised in Colorado, and wants to perform his civic duty by helping the state building a strong and functional online exchange. He said he supports exchanges and regrets having used the phrase: the good, the bad and the ugly to describe them, but he believes his comments were taken out of context. Were encouraging health plans to participate in exchanges, he said. We wouldnt be on the board if it wasnt a good thing for Colorado and consumers and the country. Its important that everyone recognize that the backbone of a viable exchange is going to be its information technology platform, he said. Its not as simple as a website. Its very important, given the limited funds, that they get it right. We have a lot of experience and hope to help. Grossman said he will recuse himself from votes if necessary. Ill recuse myself if its a direct conflict of interest with TriZetto, he said. Hickenloopers health policy advisder, Lorez Meinhold, reaffirmed the governors support for Grossman on Monday, saying he is not directly affiliated with a health insurance company, even though TriZettos profits flow directly from multiple insurance companies. Hickenloopers spokesman, Eric Brown, said Tuesday that the governors stance has not changed. Consumer groups contend that the board now has five appointees directly related to the health insurance industry, which would be a violation of Colorados new health exchange law. The law said that no more than four of the nine board members could have direct links to the health insurance industry. There will be a great deal of money at stake. Mandated under the Affordable Care Act, the health exchange must offer online health insurance to uninsured individuals and employees of small businesses. The exchange will start with an operating budget of between $10 million and $20 million, exchange staffers said Monday. Consumer groups are considering their options. If Grossman fails to resign, they could seek further action from the health exchange boards legislative oversight committee or call on Colorados Attorney General to intervene. Solutions first reported a week ago that Grossmanwrote in an October article for health insurance clients that there was gold in the exchanges. TriZetto has extensive ties to health insurance companies in Colorado and across the country.Grossman wrote that it was bad that health exchanges would create competitive marketplaces that would force health insurance companies to cut costs and increase efficiencies. Danny Katz, director of CoPIRG, said the core purpose of the new health exchange is to create a competitive market. He cant fulfill the mission of the body, Katz said. TriZetto does extensive business with multiple health insurance companies including Anthem Blue Cross which also has a representative on the board. The four industry representatives are Robert Ruiz-Moss, an executive with Anthem Blue Cross and Blue Shield; Arnold Salazar, executive director of the Colorado Health Partnerships, LLC; Elizabeth Soberg, chief executive of UnitedHealthcare of Colorado; and Stephen ErkenBrack, president and CEO of Rocky Mountain Health Plans. Dr. Michael Fallon, Republican, Denver, ER physician and nominee against U.S. Rep. Diana DeGette in 2010, appointed by Sen. Minority Leader, Mike Kopp, R-Littleton. Nathan Wilkes, Arapahoe County,founder and principal consultant, Headstorms Inc., appointed by Sen. President Brandon Shaffer, D-Longmont. Grossman said Monday that he and his company want to increase access to health insurance. We wouldnt be on the board if we had any direct or indirect conflicts of interest, Grossman said. Health clients are our primary customers. We think that relationship adds to our credentials. Nearly 100 people tried to attend the first meeting of Colorado’s health exchange board. Most were blocked from sitting in the main conference room and shuffled to overflow conference rooms. In one, audio from the meeting didn’t work. Asked about the contention that he is essentially a health insurance industry representative, Grossman would not say yes or no. I defer to the state on that. Its a complex supply chain, he said. Meinhold reiterated her view that Grossman is not directly related to an insurance company. She said the governor would not ask him to resign unless Hickenlooper saw that Grossman was doing something wrong. She wrote the criticism off to fears about something new. She said all the board members are committed to the key principles of improving access to health insurance, boosting competition, quality, affordability and transparency. But, even Sen. Betty Boyd, D-Lakewood, the co-sponsor of the health exchange bill, stood up during the packed meetingMonday to say that the board was not being transparent. 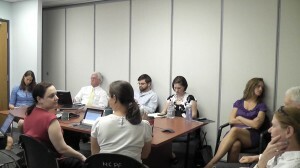 The meeting took place in a small conference room at an office building near the state Capitol. About 100 people showed up to attend the meeting, but only about 30 were allowed in the room. Others were diverted to stifling, packed overflow conference rooms. Some left after the audio connection failed to allow attendees in one conference room to hear the proceedings. My concern today is the lack of transparency, Boyd said. She said that health exchange staffers must immediately make all documents available online. The public will not be happy if that doesnt happen, Boyd said. Boyd is concerned about the interlocking relationships between Grossman and insurance industry representatives, but hasnt decided yet whether to join the calls for his resignation. As chair of the exchange boards legislative oversight committee, she plans to monitor actions of the board and decide whether to step in. Consumer advocates planned to keep up their pressure on Grossman and the governor. Im calling on him to do the right thing and resign, said Katz of CoPIRG. Elisabeth Arenales of the Colorado Center on Law and Policy did not specifically seek Grossmans resignation, but she called for the resignation of at least one of the five members who are linked to the insurance industry. We have a hard time understanding how the board can function with a majority representing the industry, Arenales said. We think that violates the spirit (of Colorados health exchange law) and the statute. De Percin said the board needs representatives who will ensure that consumers interests are served. (Grossmans) ties preclude him from acting against insurance industry interests, she said.